Dates and Venue 2 May & 4 May 2014, 8pm | SFU Goldcorp Centre for the Arts, 149 W. Hastings St.
Serious music lovers attending a concert by a large chamber ensemble wouldn’t be expected to be familiar with terms like: gesture tracking, modified artificial life system, integrated media, and a KarmetiK NotomotoN sounds like something out of Star Wars. Perhaps it’s no coincidence then, that the second of two concerts entitled HyperEnsemble and heavily featuring metacreation and electrocoustic interactivity is performed on ‘May the fourth’ – the unofficial Star Wars Day honoring the space fantasy franchise. Even by Turning Point Ensemble standards, this is a boundary-breaking concert. The adventurous contemporary ensemble has constantly pushed forward musical boundaries, recreating everything from jazz and classical to the avant-garde. The first piece is Keith Hamel’s chaotically structured “hyper-solo” trombone work Full Circle (essentially) performed by Jeremy Berkman. Hamel utilizes a webcam that picks up the movement of the trombone slide to create sampling. Berkman can occasionally be seen engaging the slide without actually playing a note. 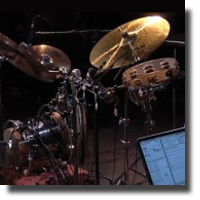 Arne Eigenfeldt’s An Unnatural Selection requires a conductor (Owen Underhill), the composer sitting at a computer keyboard, a Yamaha disklavier piano (no pianist required), robotic drum (the KarmetiK NotomotoN) and eight human musicians. The music is composed using generic algorithms, generated “on the go,” heard only once and never again. In the first movement, imagination is a way, the melody lines are quite pleasant. In the following two movements, the robotic piano integrated agreeably with the vivid detail of the orchestration, but the robotic drum seemed to be out of sync. By contrast Brenda Fedoruk provides colourful crescendos in a rich plethora of sonorous textures. Fluctuare is an electrocoustic work for solo flute interacting with a computer sourcing eight channels. In this piece, the microphone doesn’t simply amplify the sound of the flute, but draws the audience to the nuances of David Eagle’s evocative score. Keith Hamel’s Les Cloches is arguably the most earthbound work in the programme. As its title might suggest, the piece derives harmonies from the sound of tolling bells. The arrangement shifts between quiet lyricism and discordant noise, with music collectively sampled and coming from all around the hall. HyperEnsemble is definitely a unique aural experience. However, I’m still not sure as to the extent that technology enhances human performance or detracts from it.